In 1935, at the age of 16, David Humphreys Miller (1918-1992) arrived in South Dakota and began interviewing and drawing the Northern Plains Indians who were at the Battle of the Little Bighorn. Over the course of 60 years, he developed a rapport with the Plains people. Survivors who at first would not speak to him eventually shared their stories and sat for portraits. In all, he painted 72 portraits of the various survivors and captured invaluable testimony. 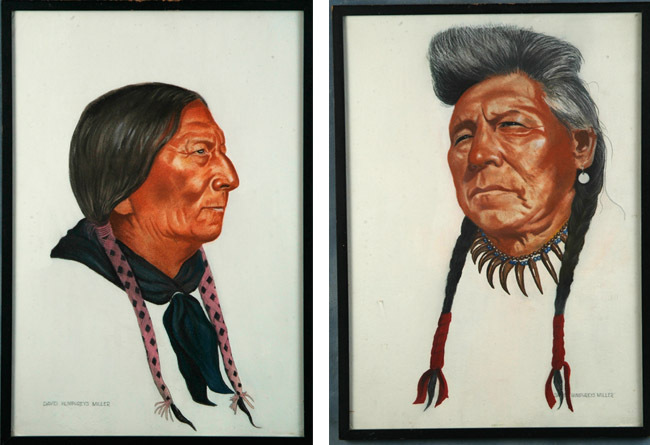 Drawn from Life: Northern Plains Indian Portraits by David Humphreys Miller presents more than 60 his field sketches and studio easel paintings. Miller studied under famed Western artists Winold Reiss and Harvey Dunn and enjoyed a close relationship with Olaf Wieghorst. He attended the University of Michigan, New York University, and the Grand Central School of Art in New York. In addition to his artistic pursuits, Miller became technical advisor about Indians for western genre films, including Cheyenne Autumn and How the West was Won. He authored several books, including Custer’s Fall (1957), based on his interviews with his subjects, and Ghost Dance (1959). Funded in part by Esther Andrau and the UW Art Museum Gala Fund. Click here for the Drawn from Life: Northern Plains Indian Portraits by David Humphreys Miller cell phone audio tour.